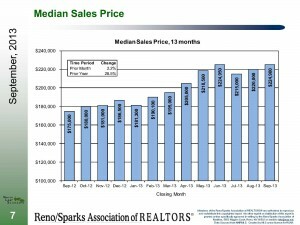 Thanks to the Reno/Sparks Association of Realtors for sending out the September market stats. The full report can be viewed by clicking the picture to the right. A summary of the major points with comments is below. The median sales price rose again after a drop two months ago. It settled at $224,900. Just below its highest point of June 2013. The short sale median price actually dropped a little but REOs and regular sales rose enough to cause market appreciation. Expect the median sales price to bounce up and down a couple percentage points each month for the foreseeable future. Units sold dropped dramatically from 628 in August to 497 in September. This is caused by the normal seasonal sales drop in the fall and sellers trying to out do each other with list prices. Average days on market for sold properties rose to 106 from 98 in August. Regular sales continue to have a couple weeks of market time before selling. New listings also dropped to 583 with 78% being regular sales and 40% being under $200,000. It seems that higher priced homes are starting to hit the market. Month’s supply of inventory rose to 4 months which is getting closer to a balanced market instead of the intensely strong seller’s market we’ve been having. Overall, expect more price reductions as sellers have out down themselves and a little up and down, within a couple percentages, for the median sales price in the next few months. Posted in For Buyers, For Sellers, Market Update and tagged reno real estate broker contact information, reno real estate market blog, reno real estate relocation information, reno realty blog stats.